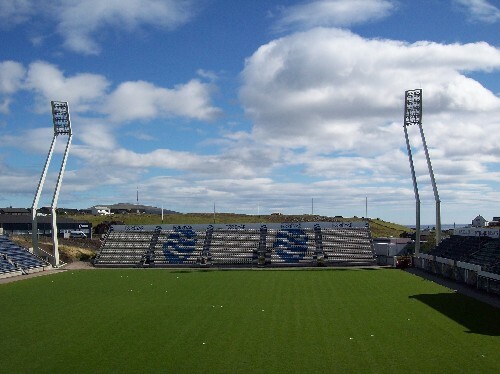 When the Faroe Islands on Friday 2 September entertain Italy in the qualifier for the European Championships in 2012 it will be the first time an international match in the Faroe Islands will be played under floodlights. – That’s almost 133 years after the first ever football match was played under floodlights at Bramall Lane, England on 14 October 1878 between two teams selected by the Sheffield Football Association, referred to as “red” and “blue”. 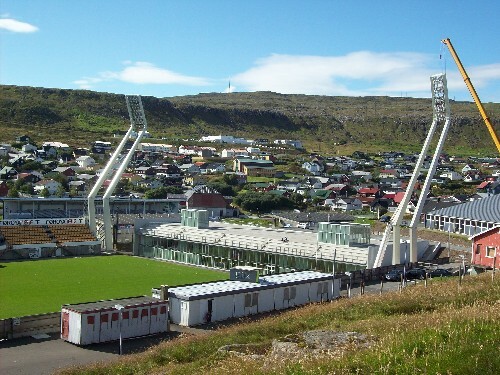 Although most football grounds in the Faroe Islands do have some sort of floodlights, the standard is very low and they can at best be used for training, but are unsuited to play important matches, especially in the highest division – although the standard may still be better higher than the 1878 edition. 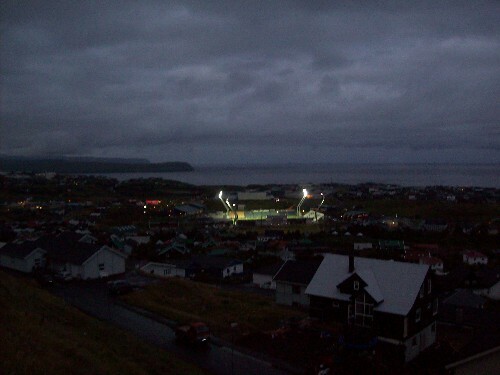 But the two grass pitches used for internationals, Tórsvøllur in Tórshavn and Svangaskarð in Toftir have never had any kind of floodlights and matches have had to be played in brought daylight. Usually that is not a problem in the summer months at it stays light until late in the evening, but in September the match would have had to start no later than 18:00 hours. And in October even sooner. Those matches could earlier be scheduled on Saturdays when the early kick off isn’t a problem, but as the international days have now been changed to Fridays instead, too many spectators can’t always show up that early. Additionally the late kick offs also suit television companies better. 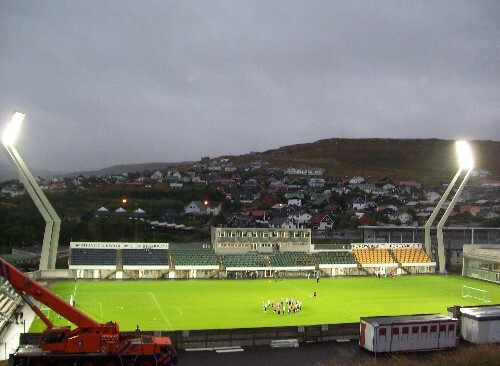 The work on the floodlights started early in the summer although the installing of the floodlights themselves didn´t start until late July and has just been completed up to the game against Italy and was officially used for the first time on Tuesday when the Faroese national team had a training session. The maximum power of the lights is 1,400 lux, which are the minimum requirements from UEFA and FIFA for televised international matches. 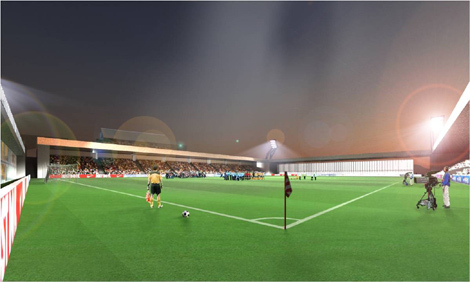 The cost of the floodlights is estimated to be around DKK 16,5. Of this, the city council pays around 1/3 while the football association pays around 2/3, which again is funded mostly by UEFA. But it ain’t pretty! – At least for now. As the lamps reach more than 40 metres into the sky, they are said to be the tallest structures in the capital and they totally dominate the skyline of the city and have therefore outraged a large part of the population. "Let there be light!" 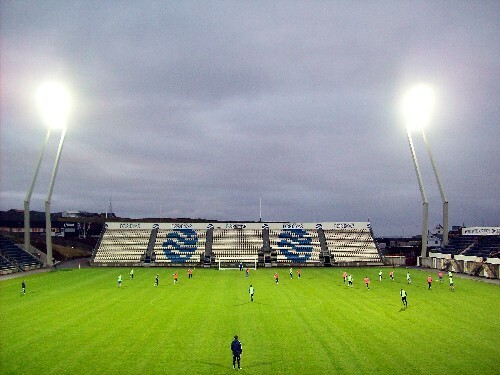 - The lights have been turned on at a training session for the Faroese international team. "Firstly, I expect the floodlights to work well. Then I expect points in the game against Italy. I expect this will be the national team's biggest ever sensation. - I have just had that feeling all the time", the 41-year old shot stopper told Faroese national radio. 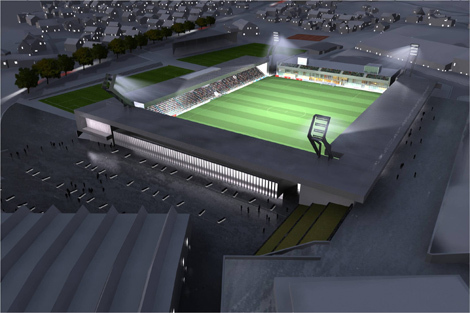 Below there are three photos of what the Tórsvøllur Stadium is going to look like according to the 5-step master plan. 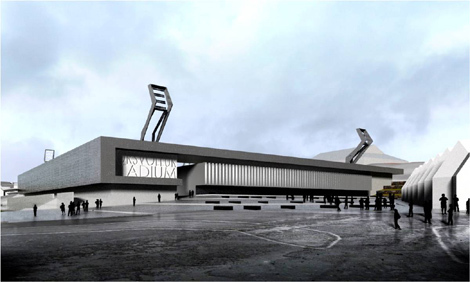 It could take several year until that will be completed – if at all, as not all has been agreed upon, yet. Faroe Islands coach Brian Kerr has picked a 20-man squad for the European qualifiers at home against Italy on Friday and away again Serbia the following Tuesday. The coach will be happy to have his strongest men back on the left hand side as it was missing the last time around in the 4-0 defeat to Northern Ireland on 10 August. Left back Einar Hanse return from injury and is likely to be in the starting position on Friday. Also left-sided midfielder Pól Jóhannus Justinussen from Valur Reykjavík returns after having served a suspension. He is likely to be in the starting position instead of Símun Samuelsen who has retuned from injury. But Kerr might also opt to use the physically strong Justinussen as left back, as that's the position he plays in at his Icelandic club. Goalkeeper Jákup Mikkelsen has pulled out because of injury and instead Undder21 goalkeeper Kristian Joensen (07 Vestur) has been drafted in to be cover for René Tórgarð, who will now get the chance between the sticks. Tórgarð has one cap to his name; a friendly against Portugal in 2008 where he played the second half. Joensen in uncapped at the senior level. Goalkeepers: René Tórgarð (EB/Streymur), Kristian Joensen (07 Vestur). Defenders: Atli Gregersen (Víkingur), Einar Hansen (NSÍ Runavík), Jónas Tór Næs (Valur Reykjavík), Jóhan Troest Davidsen (Aarhus Fremad), Rógvi Baldvinsson (Ålgård Fotballklubb), Viljormur Davidsen (FC Fyn). Midfielders: Fróði Benjaminsen (HB Tórshavn), Símun Samuelsen (HB Tórshavn), Daniel Udsen (EB/Streymur), Bogi Løkin (ÍF Fuglafjørður), Súni Olsen (B36 Tórshavn), Atli Danielsen (B36 Tórshavn), Hjalgrím Elttør (KÍ Klaksvík), Pól Jóhannus Justinussen (Valur Reykjavík), Christian Lamhauge Holst (Silkeborg IF). Forwards: Jóan Símun Edmundsson (Newcastle United), Arnbjørn Hansen (EB/Streymur), Christian R. Mouritsen (Valur Reykjavík). Goalkeepers: Gianluigi Buffon (Juventus), Morgan De Sanctis (SSC Napoli), Salvatore Sirigu (Paris Saint-Germain FC). Defenders: Davide Astori (Cagliari Calcio), Federico Balzaretti (US Città di Palermo), Leonardo Bonucci (Juventus), Mattia Cassani (ACF Fiorentina), Giorgio Chiellini (Juventus), Domenico Criscito (FC Zenit St Petersburg), Christian Maggio (SSC Napoli), Andrea Ranocchia (FC Internazionale Milano). Midfielders: Alberto Aquilani (AC Milan), Daniele De Rossi (AS Roma), Claudio Marchisio (Juventus), Riccardo Montolivo (ACF Fiorentina), Thiago Motta (FC Internazionale Milano), Antonio Nocerino (US Città di Palermo), Andrea Pirlo (Juventus). Forwards: Mario Balotelli (Manchester City FC), Antonio Cassano (AC Milan), Alberto Gilardino (ACF Fiorentina), Sebastian Giovinco (Parma FC), Giampaolo Pazzini (FC Internazionale Milano), Giuseppe Rossi (Villarreal CF). Goalkeepers: Kristian Joensen (07 Vestur), Teitur Gestsson (HB Tórshavn). 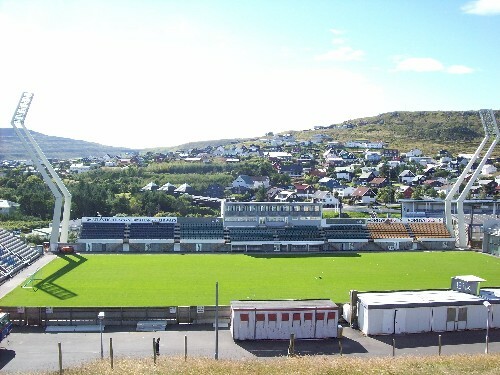 Defenders: Rógvi S Holm (HB Tórshavn), Jógvan Rói Davidsen (HB Tórshavn), Erling D Jacobsen (Víkingur), Høgni Eysturoy (B36 Tórshavn), Petur Pauli Mikkelsen (NSÍ Runavík), Heini Vatnsdal (FC Suðuroy), Sørmundur Kalsø (KÍ Klaksvík), René S Joensen (Brøndby IF). Midfielders: Hallur Hansson (HB Tórshavn), Róaldur Jakobsen (B36 Tórshavn), Andre Olsen (B68 Toftir), Dánjal á Lakjuni (ÍF Fuglafjørður), Gunnar Zachariasen (AB Copenhagen), Kaj Leo í Bartalsstovu (víkingur). Forwards: Páll Klettskarð (Víkingur), Klæmint A. Olsen (NSÍ Runavík). B71 Sandoy have signed 30 year old Polish defender Andrzej Bednarz, who has played in the Polish top league, B71 have announced. He has had about 20 club changes in the last 10-12 years. Here’s a Youtube promotional video of the player (he scores a lucky goal at 5:55). It’s doubtful if he will have received a work-permit before B71’s match against 07 Vestur on Sunday. Polish striker Lukasz Cieslewicz has extended his contract with league leaders B36 Tórshavn by two years so that he'll be at B36 until the end of 2013. 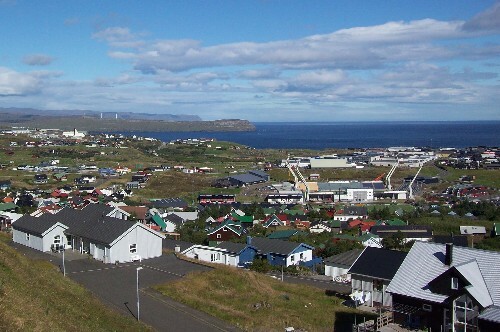 Cieslewicz spent several of his childhood years in the Faroe Islands as his father Robert played football for ÍF Fuglafjørður, VB Vágur and Sumba in the late nineties and early "noughties". Lukasz has lived in Denmark for many years also, and he hopes to become eligible to play for the Faroese national team in the future. That can take quite some time to get sorted out, however. B68 Toftirs Norwegian striker Stig-Roar Søbstad has switched to AB Argir in the 1st division. It was at AB that Søbstad started his "Faroese career" when he joined them in the second half of 2009 and scored 5 goals in 12 matches. After AB ran into financial problem midway through the following season, Søbstad moved to B36 where he failed to make an impact - also because of injuries. He then joined B68 ahead of the current season, but has had limited success; scoring 3 goals in 13 matches. As mentioned earlier, it was doubtful if B71 Sandoy's Senegalese Joseph Y. Bassene would continue at the club. He has now joined 07 Vestur. Ismail Abdul Razak to Real Valladolid! It has also been mentioned before that NSÍ Runavík's Ghanaian midfielder Ismail Abdul Razak had parted with the club. He has now signed a 3-year contract with Spanish second tier club Real Valladolid, would you believe. Ari Ellingsgaard to NSÍ RunavíkNSÍ have another player from ÍF Fuglafjørður on loan for the rest of the season; 18 year old offensive midfielder Ari Ó. Ellingsgaard who was a marginal player at ÍF. 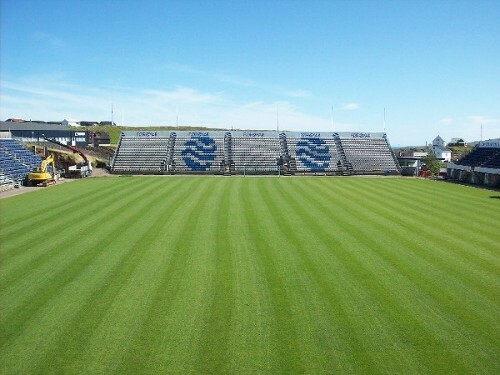 B68 have announced that they are selling the grass from the pitch at Svangaskarð Stadium which will change to artificial grass instead. Faroe Islands manager Brian Kerr has selected his team to face Northern Ireland in the Euro qualifier on Wednesday 10 August at Windsor Park, Belfast – 18:45 GMT. Goalkeepers: Jákup Mikkelsen (ÍF Fuglafjørður), René Tórgarð (EB/Streymur). Defenders: Hendrik Rubeksen (HB Tórshavn), Atli Gregersen (Víkingur), Jónas Tór Næs (Valur), Jóhan T. Davidsen (Aarhus Fremad), Rógvi Baldvinsson (Ålgård, Stavanger), Viljormur Davidsen (FC Fyn). Midfielders: Fróði Benjaminsen (HB Tórshavn), Símun Samuelsen (HB Tórshavn), Rógvi Poulsen (HB Tórshavn), Daniel Udsen (EB/Streymur), Bogi Løkin (ÍF Fuglafjørður), Súni Olsen (B36 Tórshavn), Atli Danielsen (B36 Tórshavn), Hjalgrím Elttør (KÍ Klaksvík). Forwards: Christian L. Holst (Silkeborg IF), Arnbjørn Hansen (EB/Streymur), Jóan Símun Edmundsson (Newcastle United), Christian R. Mouritsen (Valur). Because of his 89th minute red card against Estonia, Valur Reykjavík’s Pól Jóhannus Justinussen is suspended. Justinussen, who made his debut in a friendly against Scotland last year, started in his first qualifier against Slovenia in June and after a superb display was a natural starter against Estonia again 4 days later. His strong physical presence will be missed on the left hand side of midfield, both offensive and defensively. Left back Einar Hansen who played his best matches for the Faroes against Slovenia and Estonia is not in the squad this time. He has not been playing in NSÍ Runavík’s last matches. Instead Kerr has recalled HB Tórshavn´s left back Hendrik Rubbeksen who was not in the squad for the doubles-qualifiers against Slovenia and Estonia. Also central defender Jóhan Troest Davidsen returns to the squad, having been suspended in the win against Estonia, as is the case with forward Jóan Símun Edmundsson. Midfielder Daniel Udsen who missed the Estonia-game through injury is fit for fight again and also midfielder Rógvi Poulsen has returned from injury. Midfielder Bogi Løkin has been recalled after absence for some time. Offensive midfielder Símun Samuelsen had originally been selected, but he pulled out because of injury and has been “replaced” by B36 Tórshavn central defender Odmar Færø who is in the squad for the first time. Jákup Mikkelsen, who turns 41 later in the month, is still standing in for long term injured Gunnar Nielsen. The home match in October ended in a 1-1 draw. The Faroe Islands have visited Windsor Park once before; in 1991 in their 3rd ever competitive international where they managed an incredible 1-1 draw. Will history repeat itself? The Under-21 team is playing in Belfast on the same day and likewise managed a draw in the reverse at home; 0-0 where the Faroe Islands missed an added-time penalty. The Faroese team is mostly made up by familiar names from the Vodafone Division plus a couple from Denmark. Goalkeepers: Kristian Joensen (ÍF Fuglafjørður), Teitur Gestsson (HB Tórshavn).Updatde:Joensen has become injured and is replaced by Petur Meinhardi Magnussen (B68 Toftir). Defenders: Rógvi Holm (HB Tórshavn), Jan Ellingsgaard (ÍF Fuglafjørður), Rógvi E. Nielsen (07 Vestur), Kaj Leo í Bartalsstovu (Víkingur), Erling Jacobsen (Víkingur), Høgni Eysturoy (B36 Tórshavn), Jógvan Isaksen (KÍ Klaksvík), Rene S. Joensen (Brøndby IF), Uni R. Petersen (ÍF Fuglafjørður). Midfielders: Hallur Hansson (HB Tórshvn), Karl Løkin (ÍF Fuglafjørður), Dánjal á Lakjuni (ÍF Fuglafjørður), Róaldur Jakobsen (B36 Tórshvn), André Olsen (B68 Toftir), Gunnar Zachariasen (AB Copenhagen). Forwards: Klæmint Olsen (NSÍ Runavík). Originately, defender Heini Vatnsdal of FC Suðuroy had been selected, but pulled dout and has been replaced by ÍF Fuglafjørðurs Uni R. Petersen).